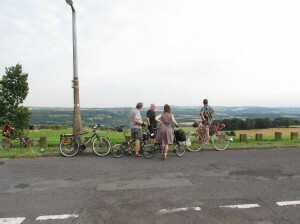 The ride had been postponed from the original date of June 13 because that day there were monsoons in Barnsley. So rescheduled for Fri Jul 11 it still started half an hour late because Mick had to go back to Sheffield for his pannier, lock and lights! Silly Mickey! So on this dry warm evening with a milky sunshine, five of us got going from the front of the massive civic beauty of Barnsley Town Hall to skirt round the site of Market Cross and the the back of the 30s splendour of the old Mining College (now a University of Huddersfield campus) to turn left onto Churchfields and into Berneslai Close to gaze at the house of Celia Wray, a Barnsley suffragette and architect. Then along the path to drop down the kerb (not enough dropped kerbs in Barnsley) onto Sackville St to ride along and admire the splendid solid Victorian and Edwardian houses before turning right to cut through an alley to come out on the road through the yard of The Grey Horse. We bombed down the hill to get to the site of the Barnsley High School for Girls. A wonderful example of the massive Edwardian school building programme that went on in private and municipal education. It seems the most famous ex-pupil is Jenni Murray of R4 Woman’s Hour and we wondered if, like Sheffield, all the famous people brought up in the town leave for better prospects. Then it was down the hill again, past some fab we think late 50s flats at Orchard Court on Cockerham Lane, to go over the railway line and turn right along Honeywell Grove which has a variety of interesting, yet mundane social housing along it from all sorts of eras and is like an exhibition of social housing. We climbed up a bit to come out on to Old Mill Lane and then drop down close to the Dearne to follow the road system round to pick up a lovely path alongside some remains of the Barnsley Canal. We couldn’t see the plaque commemorating its clearance as part of a job creation programme in the late 80s. We followed the path along the route of the canal before the reflex left turn down into the parkland. The sight of a small group of cyclists just riding round triggered friendly shouts of “Tour de France” from the teenagers we passed who were lounging around on the grass and then we all had to get off to get over the fortifications of Lord St. This is a massive steel plate barrier with a locked vehicle gate, a kissing gate, and bike gate and the whole thing must deny access to anybody who is in a wheelchair or mobility scooter. You have to get off to get through the bike gate and you may try getting through with a rack and just one pannier (you can’t). Our route was across the main Pontefract Rd and onto Oaks Lane where we stopped to chat about the buildings of Barnsley Main and we think it has now been scheduled as an ancient monument and funding has been found to do something useful with it as a heritage site. We turned right here to get on the trails over the landscaped spoil heaps to join the spur for the Trans Pennine Trail that runs into Barnsley town centre. We missed out the loop to Stairfoot and back but talked about the monument on Doncaster Rd which is the Oaks Colliery Rescuers Memorial, a memorial to the rescuers of the 1866 pit disaster – 27 of whom died in the rescue attempt. 361 people died altogether, biggest English pit disaster and 9th worst in the world. So we headed back towards town along the TPT edged past Barnsley FC at Oakwell and then up and across Sheffield Rd to climb up and then descend down to a terrace of houses on Princess St, Chatted to some residents about which one had been the newsagents used as a location in Kes but nobody could remember,(the newsagents had been the front room of a house), and they were delighted to learn that we were on a bicycle tour of tarn. So we turned up Spring St and then left along Agnes St before turning up Day St to look at 4 Agnes Terrace. This was where Orwell lodged in Barnsley whilst researching The Road to Wigan Pier. The POI on the map (see below) has more info. I always get a buzz of retracing steps like that and we discussed whether Orwell did more to create a stereotype of Northerners and the North than anyone else. Plausible? The book is still in print and being issued in collectors editions and so on. Then it was onward and upward through some fine between the wars social housing to Racecommon Lane and a fabulous view over the valley north across the Worsbrough reservoir and over to Grenoside on our right and Hoyland on the left. We could easily pick out Wentworth Castle, the site of Northern College (“Arthur’s College” as one local confirmed) and then once orientated we could pick out Wortley Hall as well – all still within BMDC boundaries. Fine stuff and a lovely evening up there with loads of residents out strolling, walking the dog or just enjoying a fine summer evening. We headed off east along the lane to enter Locke Park, disturbed and chatted with a woman doing training for a karate match up near the tower before we headed off to follow the pleasant paths past the bandstand to the statue of Joseph Locke who was a rich and accomplished railway engineer (up there with the Stephensons and Brunel) who was brought up in Barnsley. The park was a bequest to Barnsley from his widow after he died in 1860. We admired the well-built stone park-keeper’s house awaiting a resident at the front gate of the park. We left the park to descend Locke Ave with a fine view ahead of the Town Hall tower all rosy in the evening sunshine. But we turned left to get onto Shaw Lane to look at the bare patch of land that used to be The Barnsley Grammar School for Boys or Holgate School. When I started planning this ride it still stood but some act of municipal and private vandalism means that this beautiful Edwardian building was razed to the ground – why couldn’t they find an alternate use as they had with the girls’ school? Rant over. We meandered over to Station Rd and made our way down and up back to Sackville St and went round a block to Huddersfield Rd and along towards tarn to pass the NUM HQ (Arthur’s Castle) and then joined the one way system to visit the statue of Dickie Bird, discuss his life and times and whether he is a bit ‘strange’ or not and so back onto the one way to drop down Regents St along Eldon St and back up Market Hill to finish at the Old No 7, whose clientele stopped momentarily to look at 5 cyclists coming in then resumed their chat and drinking. 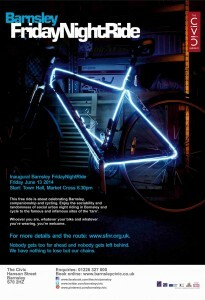 A good ride, a lovely evening and I am sure a town like Barnsley could support FridayNightRides – if it had more cyclists. Here’s some suggestions for places/themes: locations of Kes, collieries, Wortley Hall, Wentworth and Elsecar, churches, social housing, public art and so on. Boo!! There were monsoons in Barnsley on the evening of Fri 13 June. Only three people there so we tried but got v wet so called it off and two of us went to the pub! 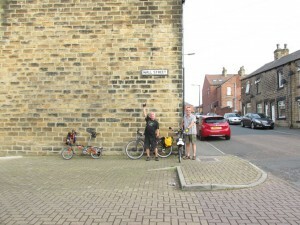 This ride is about celebrating Barnsley, companionship and cycling. 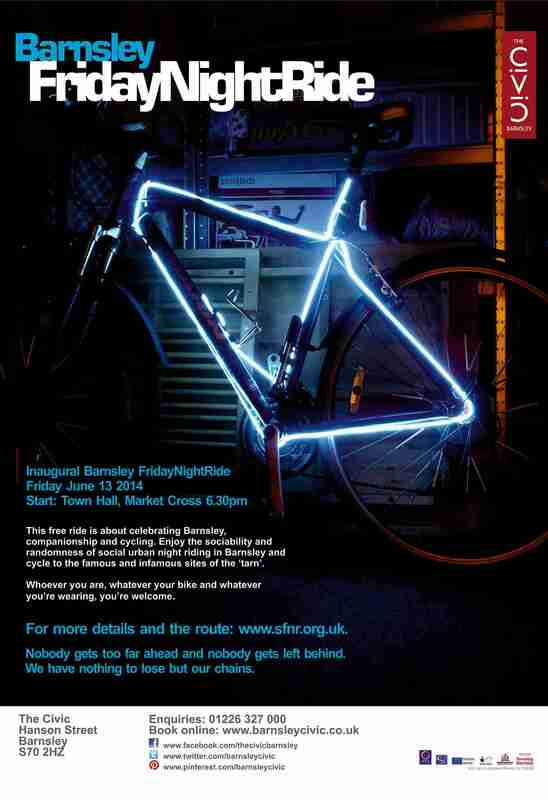 Enjoy the sociability and randomness of social urban night riding in Barnsley and cycle to the famous and infamous sites of the ‘tarn’. This ride accompanies The Bike exhibition at The Civic to celebrate any sort of cycling and the staging of the TdF in Yorkshire but you don’t have to be a lycra lout to come on this. Whoever you are, whatever your bike, and whatever you’re wearing, you’re welcome. Route and Map: This map has the route and some of the points of interest on the way. People on the ride will have stories to add, comments to make and memories will be refreshed and recollections recounted. Good chippie on the way to stop at and we are expected in the Old No 7 at the end of the ride.